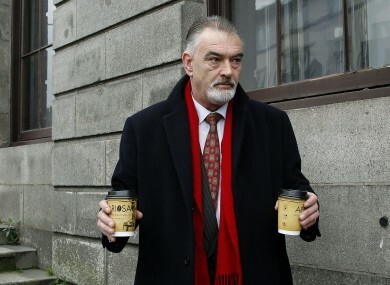 THE COST OF Ian Bailey bringing a case against the State and the gardaí is thought to be somewhere in the region of €2 million to €5 million. Someone will have to foot that bill. The choices? The taxpayer. Or Bailey himself. A judge will rule who pays for the costs of the failed action for damages over garda conduct during the investigation of the murder of Sophie Toscan du Plantier in Cork in 1996 later today. The case ran for a total of 64 days, racking up legal fees so high they hit seven figures. Bailey can argue that his case was in the public interest, and therefore the taxpayer would have to cough up for the entire thing. However, the State is also expected to lodge a submission for costs. But extracting that figure from Bailey could be difficult as it is generally thought he does not have that kind of money. The issue of costs was expected to be heard today, but it was confirmed this morning that the matter was being put back for a month, until 11 May. On 30 March, the jury of seven men and four women dismissed Bailey’s claims that gardaí unfairly targeted him as a suspect in the murder probe. He had alleged that they attempted to frame him for the killing, suing An Garda Síochána, the Minister for Justice and the Attorney General for damages. Bailey was twice arrested for the murder but was never charged. All parties denied the accusations. With just two days to go in the trial, the State won an application to dismiss most of the claims because the statutory time limit had passed. In the end, the jury just had to decide whether gardaí had conspired to obtain false statements from witness Marie Farrell through threats, intimidations and inducements which would place Bailey on Kealfadda Bridge on the night of the murder; and whether gardaí attempted to get statements from Farrell alleging that Bailey had intimidated her. After two hours of deliberations, the jury came back with a verdict – that the gardaí in question had not conspired to carry out these actions. Speaking outside court after the judgement, solicitor Frank Buttimer said his client was “very disappointed” with the outcome. He gave this case his very best effort and he thought, and he still thinks, that he very much had enough evidence to sway the jury in his favour. However, he has a deep and abiding respect for the Irish legal system. Email “Who foots the bill for the Ian Bailey case? We won't find out for a month”. Feedback on “Who foots the bill for the Ian Bailey case? We won't find out for a month”.